Archbishop Eamon Martin, President of the Irish Catholic Bishops’ Conference, met Palestinian President Mahmoud Abbas during this pilgrimage to the Holy Land. The presidents of the Bishops’ Conferences of Ireland and of England & Wales have called for solidarity with and prayers for the Christian communities who live in the Holy Land. 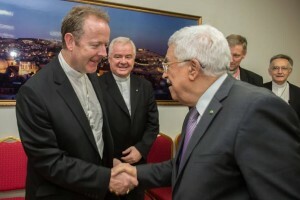 In a statement, Archbishop Eamon Martin and Cardinal Vincent Nichols said they were deeply moved by their encounters with Christians in both Israel and Palestine. The two churchmen undertook to bring back to their faithful in England, Wales and Ireland the heartfelt wishes of Christians in the Holy Land to live in peace with a sustained hope for safety and a realistic long-term future for their families and children. The Cardinal and Archbishop were returning from the Plenary Assembly of the Council of European Episcopal Conferences (CCEE) which had been meeting in Galilee and Jerusalem at the invitation of His Beatitude Fouad Twal, Latin Patriarch of Jerusalem. The European bishops visited the Christian communities in Nazareth, Mil’ya (a town near the Israeli-Lebanese border) and Bethlehem, to hear first-hand the experiences, joys and sufferings of Christian families living there. They also met the Palestinian President Mahmoud Abbas and Israeli President Dr Reuven Rivlin. The two Church leaders said the Christian qualities of charity, hospitality, faith and hope shone out on the faces of the people, young and old. In Beit-Jala, at the Bethlehem Arab Society for Rehabilitation, which specialises in care for disabled people, they witnessed first-hand the healing outreach of Christian people who seek to build bridges through health and education. However, they said that at times they also sensed the isolation that Christian communities are experiencing – their fear of being neglected or even forgotten by their brothers and sisters in other parts of the world. The Cardinal and Archbishop warned that the sustainability of their schools is critical to the well-being, identity and confidence of these Christian communities. “We communicated these concerns to President Rivlin when we met him,” they said. They also heard from the Latin Patriarch about the widespread dismay and exasperation at the continuing construction of the wall in the Cremisan Valley on the border between Israel and the West Bank. Fifty-eight Christian families will be separated from their lands and their means of livelihood.